SNC -- South vs North Challenge, an event started by Divya of You too can cook to learn many more authentic recipes from both southern and northern part of India. As u all know I don't take part much in events cos of my health issues, I should say SNC really tempted me to join with the group of lovely bloggers who are also on the same learning curve, am so happy I did. ** Traditionally the soaked/thawed green peas is grind with the spices but I've cooked the peas with little bit of water and drained completely and followed the steps. Whiz the green peas with green chillies with salt and sugar for 2 to 3 times. Transfer the mix to a bowl. Add the ginger paste, hing,cumin powder to the mix and combine well. Finally add the roasted besan flour and mix thoroughly. The mixture should be very dry ans texture should be very coarse. ** If drained the peas thoroughly there won't be any moisture left and the ground mixture would resemble crumbly. 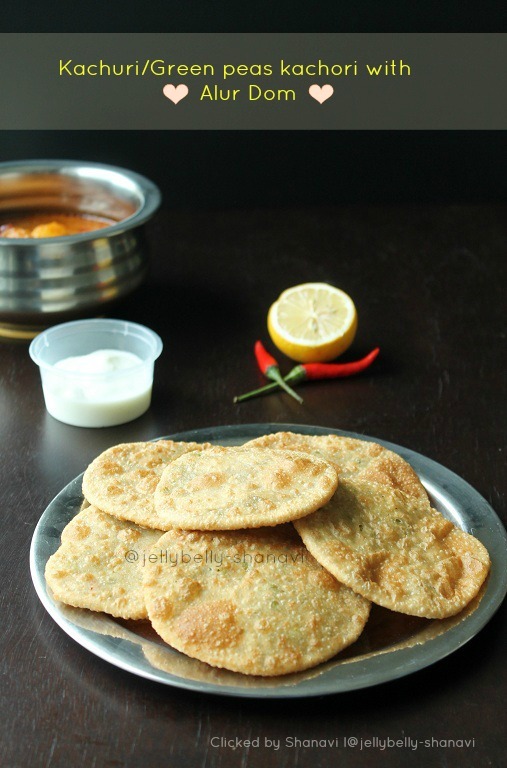 ** Traditionally all purpose flour is solely used in making kachori's. Here, I've used both aata and all purpose flour to make it slightly healthy. Add both the flour, salt to a bowl and combine thoroughly. Pour in 2 tsp of oil and finely mix it. Form a well in the middle, add water little by little and form a stiff dough. Apply the remaining oil on the top of the dough. Leave the dough to rest for min 20 minutes. Later knead the dough and divide them into small sized equal balls and cover it with a cloth. Take one by one and roll out to a small circle. Now place 1 to 2 filling in the middle and cover the filling and form a round ball. Apply oil on the working space and roll out the stuffed balls to thin puri's. Heat oil on medium high and heat the oil until it's hot but not like smoking hot, just the way u want for the puri. After stuffing the filling ,form them a round ball and roll out as slightly thick roti's. Baste both sides of the roti with very little of oil. 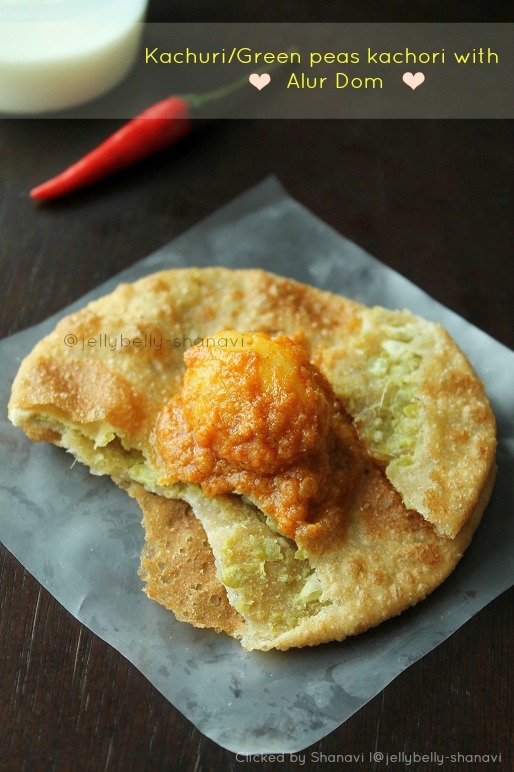 Heat a tawa for a minute and place the kachori. Wait for 10 secs. Now drizzle very little oil around the kachori and cook for few minutes on medium heat. Flip the kachori to the other side and again drizzle little bit of oil and cook until it gets cooked perfectly. And when I say little bit of oil, it means drops of oil. Serve with Alur dom. Baby potatoes -- 16 nos. Green chillies -- 2 nos. Cloves -- 4 to 5 nos. Bay leaf -- 1 no. Parboil the potatoes and peel the skin. Heat a tbsp of oil and add the parboiled potatoes followed by a pinch of turmeric powder, half of red chilli powder and salt. Fry the potatoes on medium heat for 4 to 5 minutes. Transfer them to a bowl and add the remaining oil and fry the ginger paste, also do the seasoning with cinnamon, cloves, cardamom and bay leaves. Add the ground onion paste and fry in the hot oil till u get rid of the raw smell and starts leaving oil. Pour in the tomato puree and cook again for few minutes. Add the spice powders one by one except garam masala powder and mix with the masala. Cover the pan and cook for 4 to 5 minutes on medium heat so that the spice powder gets infused with the masala. Pour in the 1/4 cup of yoghurt ( heat/flame should be low) and mix throughly with the masala. Again cook for 2 to 3 minutes. Dump in the roasted potatoes and the whole green chillies to the masala and 1/4 cup of water. Combine well. Cover the pan and cook until the oil floats on top. Serve hot with Kachuri. Wowww.. lovely and delicious recipes.. wonderful combination too.. thanks for the recipes dear.. pretty snaps !! Beautiful pictures Shanavi..love the red chilli. I am sure sure the food must have tasted as good as it is looking. Nice n delicious combo..had this very recently..
Well made kachori's look very inviting! Very well made and inviting! Drooling over ur alur dum.Superb pictures. Super delicious recipe dear, making me drool. Luvd it. Antha full plateum intha pakkama anupi vidunga Shobana, yennaku pasikuthu. Super clicks, chance'e illa. 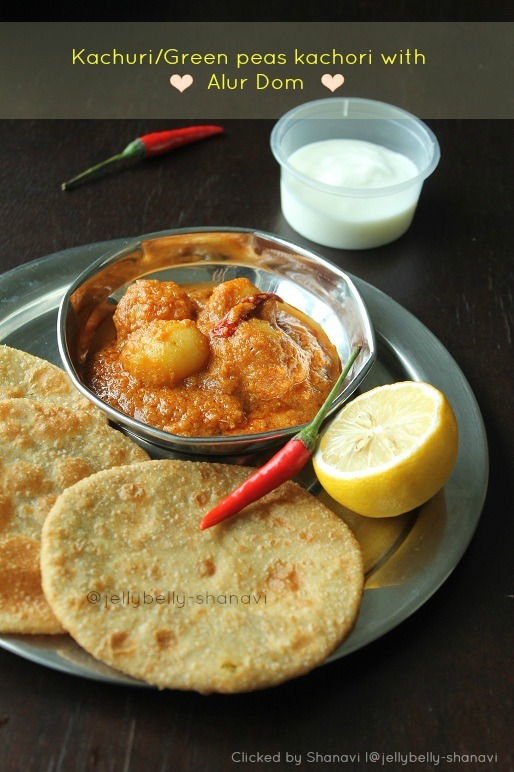 Delicious kachuri and aloo dum. Kachori is one of my favorite and can finish the entire plate. looks yum..tawa fry is great idea..
Love the tawa fried kachori version, your dum aloo looks luscious dear. Perfectly presented. perfectly made ,love the perfect circles,lovely clicks. Fantastic pics of this mouthwatering & tempting combo!! Perfectly made kachori and dum aloo. Both combo are really very tempting and delicious. Congratulations. Liked the touch of red chilli. First time here nice to know u through SNC. Lovely click nice background too. I am feeling hungry looking at ur pic. delicious clicks and picture perfect pictures!! !